A blend of Hárslevelü (50%), Juhfark (20%), Olaszrizling (20%) and Furmint (10%) from organically and biodynamically farmed vines grown at the base of the Somló (pronounced shom-low) volcano in southwest Hungary, not far from the Austrian border. The region’s basalt is weathered and topped with loess and light sand deposits, producing a fertile soil. The winemaking – which takes place at the estate’s Burgenland winery on the Austrian side of the border – is non-interventionist, with no additions except, possibly, a tiny squirt of sulphur at bottling. Screwcapped. 12% ABV. Quebec agent: La QV. 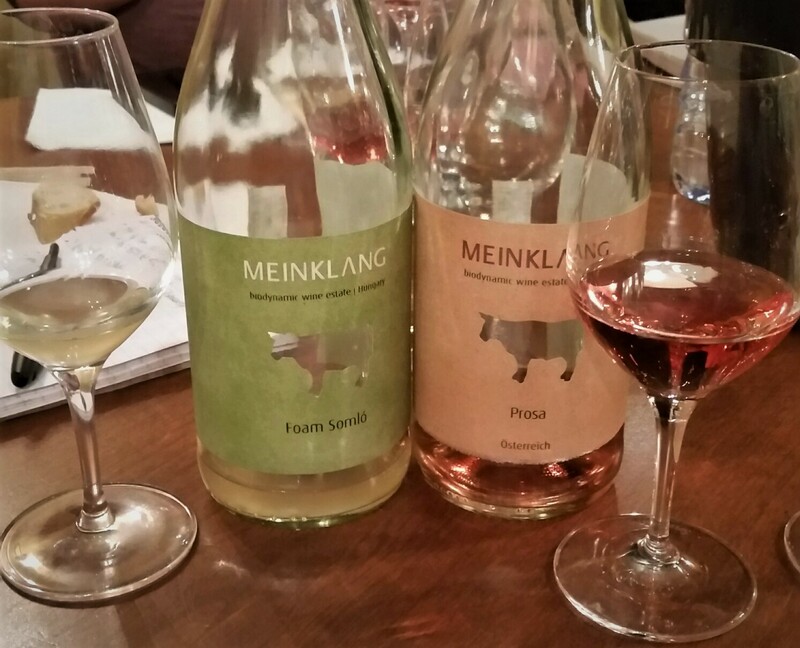 Meinklang makes affordably priced natural wines that are always stable, always clean and always loveable. The estate is one of the most ecological and sustainable in the world. Its packaging is fun. Why, then, are this and the other wines in the line (Grüner Veltliner, Blaufränkisch, Blauburgunder, Zweigelt, Saint Laurent, etc.) not available at the SAQ? By the way, also poured at the Salon VIP were two Meinklang wines aged in 900-litre concrete eggs: Konkret white (Traminer, I think) and red (Sankt Laurent). Amazing, especially the red. The good news is that La QV say they’re going to start bringing in some of the higher-end Meinklang bottlings, including the Konkret cuvées, some of the stunning monovarietal Hungarian whites and oddities like the Graupert (“unkempt”) Pinot Gris and Zweigelt, which are made from grapes from unpruned, untrained vines. The tasting ended with a dessert wine, a Tokaji Aszú from Béres, the producer of the dry whites that so impressed us in the third flight. As the aszú designation indicates, some of the grapes had been shrivelled and concentrated by Botrytis cinerea (aka noble rot). Assuming the Béres is made according to standard practice, the botrytized grapes are destemmed, stored for about a week and “then kneaded to a pulp which is added to a base Tokaji wine, or to must, by the puttony (a hod of twenty to twenty-five kilos). The eventual sweetness depends on the number of puttonyos added to the 136-140-litre barrels (called gönchi) of one-year-old base wine – usually 3, 4 and 5 puttonyos; 6 is exceptional,” quoting Hugh Johnson’s Wine Companion. A blend of Hárslevelü and Furmint from vines between six and 32 years old. Manually harvested. Fermented with selected yeasts in Hungarian oak barrels for four weeks. Did not undergo malolactic fermentation. Matured off the lees in 220-litre Hungarian oak barrels for 24 months. Lightly filtered, then bottled and aged another 12 months before release. 9.5% ABV. Quebec agent: Valmonti. Like many Tokaji Aszús, this would make an exquisite pairing for foie gras. At the tasting, it was served with the clementine and almond syrup cake (sans chocolate icing) from Ottolenghi and Tamimi’s excellent Jerusalem cookbook. While I’d figured the pairing would work, it proved to do far more than that: not only did the wine and the cake make each other taste better, the effect was quite different depending on which you tasted first. Manufacturer of a vitamin supplement popular in Hungary, the Béres family acquired a 45-hectare estate near the village of Erdőbénye, in the heart of the Tokaj-Hegyalja wine region, in 2002. A 50-50 blend of Furmint and Hárslevelü from nearly decade old vines. Naparany (“sungold”) refers to the latter’s colour. Manually harvested. Alcoholic fermentation with Saccharomyces cerevisiae yeast takes place in stainless steel tanks lasts three weeks. Prevented from undergoing malolactic fermentation. Matured on the lees three months in third- and fourth-fill Hungarian oak casks. Filtered before bottling. Aged six months in bottle before release. 6.3 g/l acidity, 2.3 g/l residual sugar, 13.5% ABV. Quebec agent: Valmonti. The estate’s flagship wine. 100% Furmint from 30-year-old vines growing in the Löcse vineyard. Alcoholic fermentation with indigenous yeasts in Hungarian oak casks lasts one month. Prevented from undergoing malolactic fermentation. Maturation on the lees in 30% new Hungarian oak barrels lasts eight months. Filtered before bottling. Aged three months in bottle before release. 6.1 g/l acidity, 1.7 g/l residual sugar, 14.5% ABV. Quebec agent: Valmonti. For many of the assembled tasters, this was the flight of the night. The QPR for both wines is off the charts. The dry Tokajis available at the SAQ come in two styles: fresh and bright if somewhat internationalized (see Château Pajzos) or substantial and savoury, wines to contend with (see Oremus). This new arrival falls squarely in the second group. At things stand now, there’s not much in the system; if you’re interested, don’t dawdle. 100% Furmint from 30-year-old vines in the Löcse vineyard. Fermented using native yeasts. Aged eight months in 30% new Hungarian oak casks. Did not undergo malolactic fermentation. Filtered before bottling. Pale gold with a faint green cast. Subtle, complex, elusive nose: peach, ash, fern fronds, quartz. Plump and sweet-seeming at first though actually quite acidic and dry. Fruit fades to a honeyed, minerally finish with an intriguing sourness, a faint but persistent bitter almond note and a WTF?! warming/burning sensation like you get after eating a fiery goulash or chewing a peppercorn. Unique, formidable and pretty fantastic. Paired nicely with a chicken roasted with cumin and Seville oranges. Can also see it working with pork, veal and white fish.